» Can Sociology Save Your Life? Can Sociology Save Your Life? Comment : Comments Off on Can Sociology Save Your Life? It’s sometimes difficult for students to see professors as people other than graders or lecturers. Recently, Berkeley Connect Sociology held an open, honest, and encouraging dialogue to help students get to know the professors who choose to teach sociology at UC Berkeley. 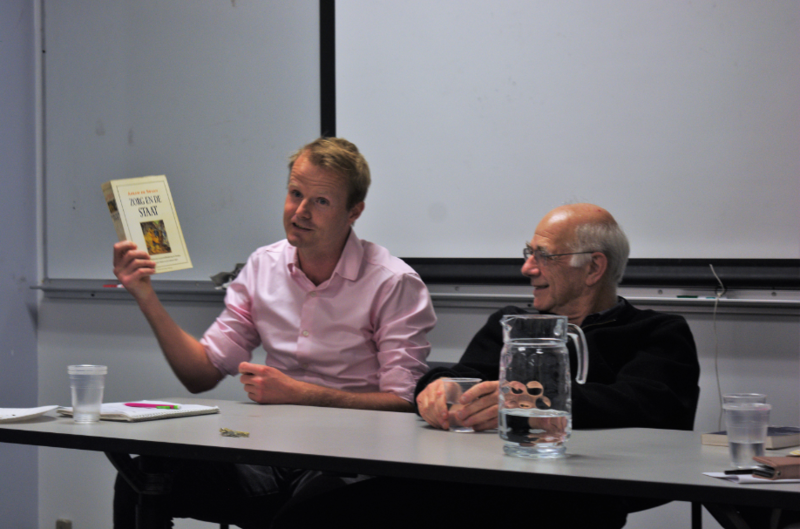 Two new professors, Robert Braun and Yan Long, joined with experienced professor Michael Burawoy to discuss their individual passions for sociology and their journey to this field. Braun’s path to sociology did not travel in a straight line. While studying political science in Amsterdam, Braun worked as a parking crew attendant. One day, he was called in for a promotion. What others would view as a momentous occasion was a startling wake-up call for him — Braun realized he didn’t want to do this for the rest of his life. Trying to figure out where he truly wanted to go, he switched majors to history. One day, during a history class, he listened to a lecturer passionately discuss teaspoons in Belgium. Braun didn’t share the instructor’s excitement for this narrow subject. However, he persevered. Braun and his peers were instructed to read “Zorg en de Staat”, translated to Care of the State. The book explained where welfare states come from — why some countries are identified as welfare states and others aren’t. While traditional history books Braun studied discussed highly specific, niche subjects, this book tackled momentous questions as it studied a collective 400 years of history in five different countries. He loved it. Braun came to class well-prepared to discuss the greatness of this book — only to have his professor verbally destroy it. After Braun defended it, the professor indignantly responded, “If you like this so much, then why don’t you become a sociologist?” It turns out that Care of the State wasn’t written by a historian, but by a sociologist. And that’s how Braun got into sociology. Burawoy faced similar difficulty in his initial major. Studying mathematics at the University of Cambridge, he was deeply depressed, hating both the subject and the environment. Cambridge was isolated and insular, removed from the rest of the world. He watched with wonder the bright, grand youth movements happening in that time (the 1960s), as he struggled amongst the ominous nooks of the dark Christ College library. While contemplating his depression, he caught sight of a book entitled Suicide on the shelf. He saw it as a sign from the universe and picked up the book, expecting it to be an instruction manual. However, Burawoy was in for a surprise. The book discussed the social relations surrounding depressed persons, explaining that the depression wasn’t something inherent within him but rather a product of the social relations surrounding him. Instead of a morbid guide, it was a liberation. This book is an acclaimed work by Emile Durkheim, otherwise known as the originator of modern sociology. Following this encounter, Burawoy decided to become a sociologist. Literally, sociology saved him. Long didn’t have one particular moment that made her realize that sociology was for her. Instead, it was a long, painful process. Growing up in China, she was raised following the traditional track expected of her — partaking in all the extracurricular and academic activities, like the Mathematic Olympians club (except she was bad at it: “the sign of a true sociologist — to be bad at mathematics,” Burawoy quipped). However, Long was determined to excel in math because of parental expectations. Under Chinese policy, her parents could only have one child; they had hoped for a boy. Long felt like a disappointment to her parents; this was only exacerbated by her passion for social sciences rather than something in STEM. Upon taking the college entry exam, Long lamented her low score–she was only #18 among 7-8 million. In a highly competitive and extremely judgmental culture, Long felt like a loser. Once she entered Beijing University, Long finally had access to books; previously her parents hadn’t let her read for fun. With this newfound freedom, Long devoured books like they were Michelin-starred meals. After reading The Protestant Ethic, Long felt like her world turned from black-and-white to Technicolor. She started doing field work, which served as an escape to a different world, exposing her to the beauty of exploring the world around her. Thus, she started her journey towards sociology. Professors usually seem like super-confident, supremely-competent experts. Yet each of these professors was once a student who didn’t know quite what they wanted to do or who they wanted to be. By sharing their personal stories, including the challenges they faced, they made the gap between professors and students seem a little less vast. It’s also powerful to note that all of these professors grew up outside the United States, highlighting the multicultural diversity of UC Berkeley’s sociology department. This isn’t regularly seen in other universities, the professors said. Talk to your professors. Ask them questions about their lives. Every professor is not only an academic, but a human with a passion for the subject they’re teaching. Learn about them. You’ll be surprised at what you’ll find.